What is the relationship between real estate space and carceral space? This panel brings together organizers, policy makers, and scholars to discuss the intersection of policing and housing policies. 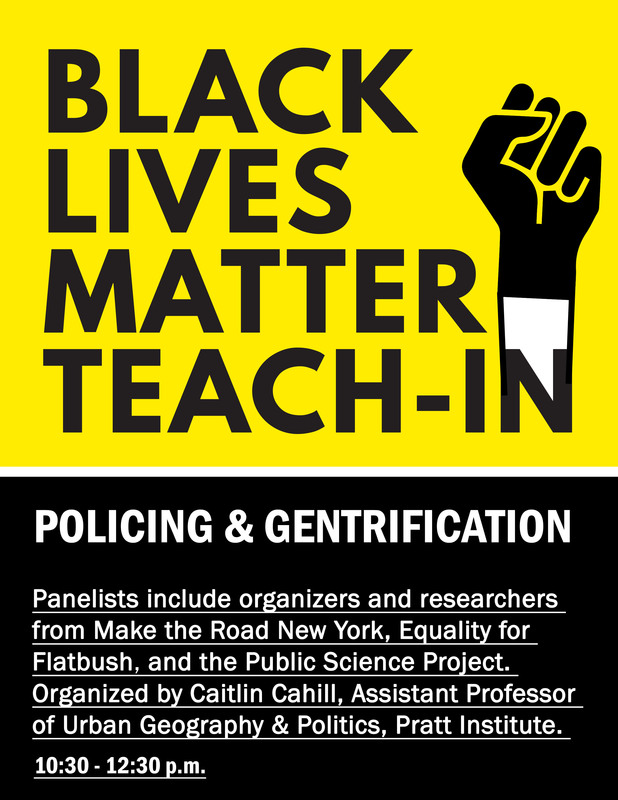 We will discuss racialized policing practices in rapidly gentrifying neighborhoods, and what this means in the context of the rezoning of New York City. How do urban development practices and the imperatives for increased policing intertwine in the everyday lives of long time community members? In the Bloomberg years, over 1/3 of the city was rezoned and 40,000 new buildings were built. At the same time, unprecedented numbers of people were stopped by the police (almost 700,000 at its peak in 2011); 83% of the people stopped were Black and/or Latino, half were under the age of 25. But what’s happening right now ? Come join us to discuss and strategize. Panelists include organizers and researchers from Make the Road New York, Equality for Flatbush, and the Public Science Project. Organized by Caitlin Cahill, Assistant Professor of Urban Geography and Politics, Pratt Institute.